LENGTH: Less than 40 inches. Including a deep central footplate and rearmost anti tip wheels. Shorter than almost all other powerchairs. Manufacturers quote mid drive/6 wheel powerchairs with casters in the "shortest" rotated position and ignore footplates. Much Shorter (& narrower) than an X5 or Quantum Q6000 or R4000 for e.g. And more manoeuvrable with lower seat height too! WIDTH: 25.25 inches. Measured with an 18 inch wide cushion in place. That's narrower than almost all other "hi end" powerchairs. And the manufacturers quote minimum figures ignoring any controls sticking out and with a narrow seat cushion in place. I don't! SEAT HEIGHT: 17 inches (can be as low as 16.5 upwards) All current F55s seat riser, tilt, recline, elevating leg rests, etc and specialist seating can be accommodated as needed. It would make it worse as a powerchair and I don't need it. The main frame is still F55s Sunrise so all options for the F55s powerchair can be fitted. Its about the only stock part. SPEED, MOTORS & CONTROL: 6.2 mph with EMD 4 Pole motors + 100 Amp P & G Control System. Or soon to be 8.5 mph with "Groove" 4 pole motors and a Dynamic DX2 Control System (240 true total amps) In both cases completely reprogrammed for true & accurate response rather than the delayed action offerings from all the big main manufacturers. CHARGING OPTIONS: 30 Amp 1 hour approx fast charge + Dual 10 Amp charger for superior overnight 5 to 6 hours charging + Up to 100 Amp direct from your car for a VERY FAST charge while out during the day as needed. BATTERIES: 68Ah Odyssey AGM Deep Cycle Group 34 (preferred) or 73Ah MK Group 24 Gel. Odyssey AGM batteries can produce more Amps when the going gets tough and be charged faster and give greater performance as well as better range in "powerful" powerchairs than MK Gels. MK give greater "Cycle" life by around 20 percent on paper. Any group 34, or 24 will fit but no others I know of are worth even considering. WHEELS & TYRES: 145/70 - 6 All Terrain 4 Ply, Tubeless, low pressure high floatation tyres on single piece steel wheels on the rear. These are good on snow, mud, sand, and offer superb vibration and bump absorption. 3.00 - 4 (9.5 inch x 3) tyres on 4 x 3 two bit rims on front casters. These carry little weight and don't sink in soft surfaces due to width and roll over uneven surfaces because of diameter. Tubeless tyres offer approx 20x better puncture deflation risk. And they have sealant inside too. WEIGHT: Unknown. But lots lighter than Donor F55 powerchair. GROUND CLEARANCE: 4 Inches. Better than most powerchairs. CARRYING CAPACITY: It happily carries a 25 stone adult. Heavier would be a bit much for the batteries. Range and performance would suffer. Structural integrity not an issue. LONGEVITY: ALL PARTS (Yes every single last unseen part!) is either heavily POWDER COATED in an oven or made from polished Stainless Steel. This includes every single nut, bolt, washer, bracket and spacer. All assembled parts are basically not going to corrode even in sea water or on our salty dirty winter roads. It should wash completely clean year after year with no or very little deterioration. All bearings are also stainless steel. No more failed rusty bearings on casters... Upholstery, motors, batteries will need periodic replacement as they deteriorate. But this is unavoidable. So unlike mass market chairs it will still look just as good after the winter with a jet-wash and polish! RADIO CONTROLLED: Want to fetch your powerchair from the shower room to the bed? 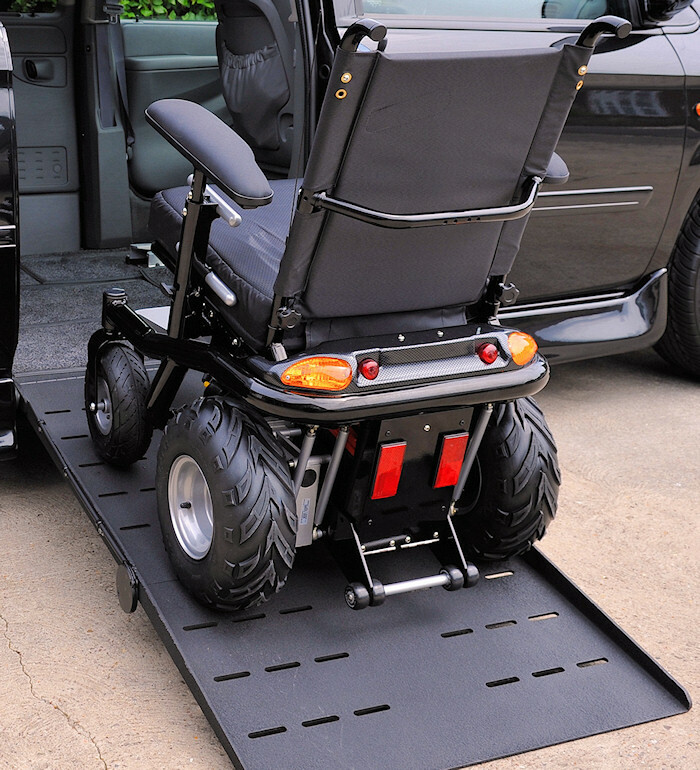 Want to load a spare powerchair into your van? No problem! Or just for fun or to scare the dog! I drive my powerchairs remotely all the time. ALL powerchairs should be equipped with radio control. Its very, very useful! Watch! Especially when you have 3 of them. We all need a backup powerchair after all. Please ignore the device on the seat. That is my special home built Radio Control Adapter that allows me to move these different powerchairs around to work on / photograph them etc. Full sized image Sunrise Medical F55s seriously redesigned! Almost every single part of this chair is redesigned or fabricated from scratch or modified/replaced with better parts. With the exception of the main frame rail. Its seriously short. sub 40 inches including long footplate. And very manoeuvrable indoors. It is in fact shorter and narrower than any other top end powerchair. Whilst still being truly outdoor capable with all day range. When you reverse to a wall the first thing to touch is your head. Not a great chunk of wheelchair that hangs out behind you. And the Main drive wheels are almost under you. Much like a mid drive powerchair. Footplate and seat height is easily adjustable as is seating angle. And it can be as low as 16 inches. Here it is 17.5 inches since its tilted back quite steeply. Power module bolted under seat where there is fresh cooling air hitting it as you drive. Ground clearance is 4 inches. Snow, sandy beaches, mud etc is all easy! Notice the two heavy duty charge sockets (12v + 12v) on the side of the seat frame. This allows charging typically in 1 hour during the day as needed both at home or from your car.directly. Anti tip wheels are inboard and short as well as 4 inches high. They do not hit anything and serve only to stop you accidentally wheelying over the back only. All bearings, bolts etc are stainless steel. One single bolt undoes the battery compartment door. Batteries just slide straight out on rails. Looks at home in my kitchen. Modified fat tyred F55s is narrow and short as well as powerful and taught! F55s Seriously modified and slightly modified comparison! Large image! 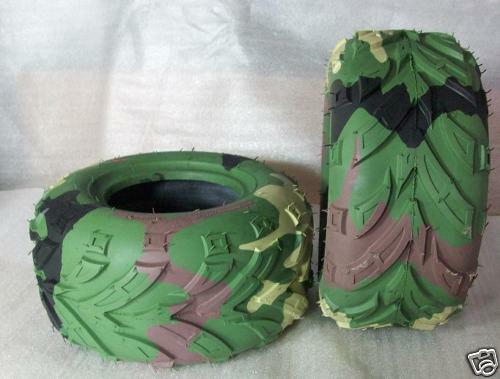 Here is the very heavily modified FAT TYRE version compared to the lightly modified version on the right. (An older version!) I don't have an original standard/stock Sunrise Medical Quickie F55s Powerchair anywhere to compare either of these two with. But there are huge differences between either of these and a stock F55 Quickie Powerchair. Both of these are hugely better performing, both indoors and outdoors than any other top end powerchair including the standard (awful) F55 powerchairs these were based on. Both allow very fast charging from the wall or a vehicle, Both have lots of power and accurate instant control response. 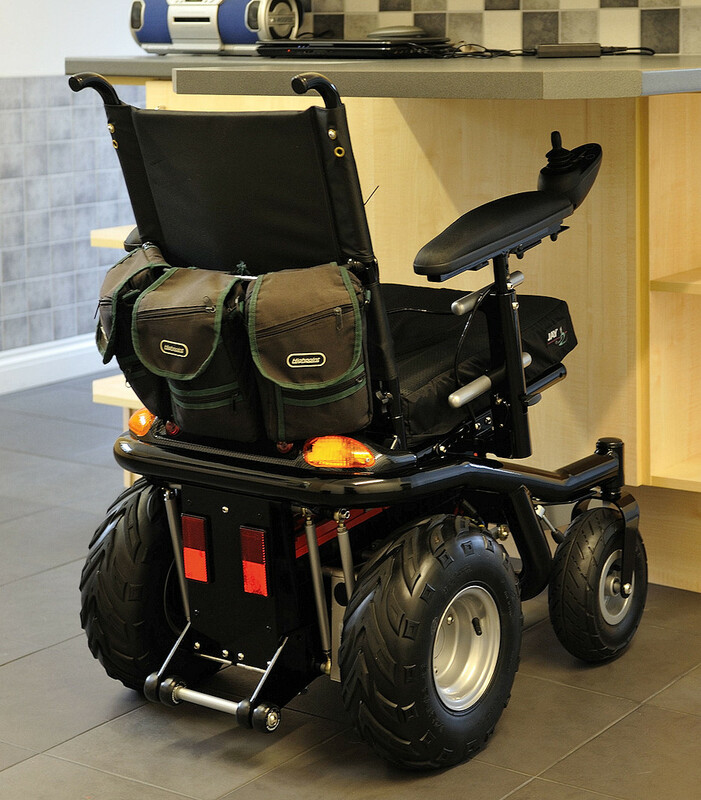 Both can wheelie, Both can fit into small indoor areas better than any other powerchairs including mid drive / 6 wheel ones. Both have stronger less puncture prone 4 ply road going tubeless tyres. Both have a very rearward C of G meaning they are nimble and very manoeuvrable. Both are the same narrow 25.25 inches wide with no "corners". Both have 100 amp control systems, programmed for accurate control. (Soon to be swapped for 240 amp systems!) Both have AGM Odyssey batteries for better performance under heavy load. The one on the right is longer at 42 inches compared to a little under 40 inches for the one on the left. The one on the left is hugely better outdoors and in snow/sand/mud and offers a better ride everywhere. With no downsides. Both have tilting seats but could also have seat risers/ recline / leg elevators etc as required very easily. Both are finished hugely better than any production powerchair. All parts that may corrode such as bolts, nuts, bearings, spacers etc are replaced with stainless steel. All painted parts are heavily powder coated. That includes every single bracket and hidden part too. Built to survive our winters! THERE ARE NO OTHER CONTENDERS. ANYWHERE! 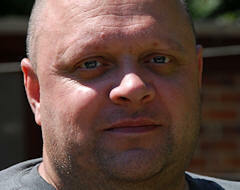 I have scoured the web, the industry, the advertising on both sides of the Atlantic for 12 years. And there simply isn't another powerchair that comes even close. I have tested and examined everything available or at very least looked at the specs of the ones I cant test. All are pretty much the same. The Frontier X5: Detail As good (if not even better) off road. But pretty useless indoors with it being too wide (28.5 inches!) too long, too high (seat) so it feels like a tank. And has the usual delayed action programming issues but not as bad as most. It also has build quality issues (mainly seat/footrest/arms) and is limited by Gel batteries (power) if the programming is sorted out. Quantum R4000 & R4400. Detail Outdoors on streets it rattles your teeth out (skinny hard 3.00 x 8 tyres) is less capable on sand, grass, snow etc. Is both considerably longer and slightly wider my own chair here so its less good indoors. And has less ground clearance. Especially cumbersome when you realise how front heavy it is. Its programming is among the worst for control. Big bum makes it ugly. Bounders. All too long, way too heavy, very dated. Rough ride on our streets unless: You fit the "off road package" - gives the same rear tyres as the X5 and my own chair use. But they just stick them on the outside meaning its hugely too wide. WRONG! But they do steer. In a heavy kind of way... Huge ugly bum again! Quickie Groove?. Modular. If you hear that word run! It means it can be assembled in many ways and combinations. And it is of course it means its bad at every one just as a jack of all trades is no good at any. And there are all kinds of issues with its control system. Although I like its 8mph motors. Shame they are wasted on this chair! Invacare's chairs just kind of repeat the Pride Quantum ones with all the same issues. As do all the rest. All very much the same. All of the manufacturers seem to concentrate on god knows how many combinations of fancy trick seating but don't get the basic powerchair right! It seems that its not important! Well it is to me! Mine fits my bathroom because its smaller in every direction than all of the above. And my van easily, It can be fast charged as needed at home or when out from a vehicle, go on the beach, off road, in snow, through woods, steers properly, does not corrode and offers a far smoother ride on our streets. Point me at another single powerchair that can do that, and I will buy one! Its designed and built to be as tight and compact and as controllable as humanly possible whilst giving a soft smooth ride both indoors, on pavements or on the street. Or the beach/snow. No other chair can. UPDATE: Had a comment from a Powerchair manufacturer (that will remain nameless) by email. Saying that: "they couldn't possibly use these 145/70 - 6 tyres because they needed non black "non marking" tyres for indoor use." They also happen to be available in Red, Green, Blue, Yellow, Pink, and CAMOUFLAGE should you want them. And probably in Grey too if you wanted. And no this isn't a joke. Another excuse shot down in flames. The real reason of course is that we accept the overweight, underpowered, badly programmed, oversized, harsh riding powerchairs that the "industry" give us now. And they don't need to bother to get themselves organised and develop and move forwards as there's little competition and big profits. Or maybe its just genuinely beyond them. I think the majority of them just have no clue.